Liquefied Natural Gas (LNG) from the Jubilee field is set to continue its dominance in the local gas market despite the indigenous product being more expensive than imported ones. Commercial gas production from the Jubilee field, which is processed at the Ghana National Gas Company’s Gas Processing Plant at Atuabo raised the prospects of a price war in the supply of gas for power generation when it debuted on the market last year. However, the Atuabo gas is now one of the priciest commodities in the world, retailing to consumers at a uniform cost of US$8.84 for every MMBtu (million metric British thermal units) of gas delivered, which is even more expensive than the US$8.75 per MMBtu its regional competitor from Nigeria- the West Africa Gas Pipeline Company (WAGP) – on the average sells to power producers. Comparatively, the average spot (Henry Hub) price in the United States of America in 2015 fell below the projected average of $3.86 per MMBtu to $3 per mmBtu. Average gas price in the European Union (EU) also fell from about $10 per MMBtu in 2014 to $7.26 per MMBtu in 2015. The EU Natural Gas Import Price dropped from $5.35 per MMBtu beginning of this year to around $4.20 per MMBtu in early March. This year, it is estimated that the Atuabo gas price will remain uniform at $8.84/MMBtu but that of the average annual delivery price of WAGP gas to Volta River Authority (VRA) will drop slightly to $8.7/MMBtu. This, the Energy Commission of Ghana explains is due to the fact that gas from Nigeria- with significant inbuilt cost than Ghana Gas- has been indexed to the global crude oil price, indicating that the average price of WAGP gas retailed to consumers in the country could end the year far cheaper than Ghana gas as long as crude oil price-currently trading at about US$46 a barrel- keeps declining. Yet, the Volta River Authority (VRA) – the biggest power producer in the country- has ramped up supplies from Ghana Gas despite the cost of the indigenous commodity, which makes it less cost effective to generate power. 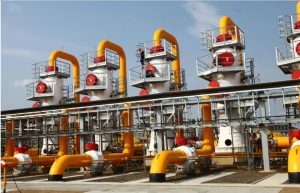 This year, the Commission has estimated that about US$494 million will be required to procure natural gas for the various thermal plants as gas flow required for fuelling the various thermal plants this year would range between 120,000-146,400 mmscf. In 2015, total gas flow for power generation was a little above 46.9 million mmBtu, which is almost twice that of 2014 with more than half coming from the Atuabo gas processing plant while gas from Nigeria through the WAGP accounted for the remaining 44 percent. Hitherto, WAGP was the main supplier of LNG for power generation with its supplies in 2014 for instance making up 95.4 percent of gas for power generation while Atuabo accounted for 4.6 percent. However, B&FT understands the growing reliance on Ghana Gas is due to the fact that the VRA is cash-strapped and does not want to continue to accumulate debts owed the WAGP, which often disrupts energy generation activities by cutting supplies to force the debts to be paid. Currently, Ghana is experiencing a severe erratic power supply challenges that on a daily basis have left many business and homes without electricity for at least 12 hours, a situation the President, John Mahama has attributed to militant disturbances on pipelines in Nigeria resulting in erratic flow of gas from WAGP at a time inflows from Ghana’s own Atuabo gas plant is going through operational challenges. According to the Energy Commission, inadequate gas supply from Nigeria through the WAGP could not only be due to capacity challenges in Nigeria but finance as well. “Persistent untimely payment of gas delivered and the huge debt burdens of the off-takers most of the public entities are the bane or the weakest link along the electricity supply-distribution value chain,” the Commission said in its latest assessment report on the energy demand and supply in the country. The Energy Commission says the VRA has been indebted to N-Gas of Nigeria for gas supplied exceeding three months and over $100 million as at the end of 2015. Besides, debt accrued by beginning of this year till early March, 2016 is over $100 million. Ghana also owed neighbouring Ivory Coast for power imports as at the end of last year. On the domestic side, VRA owes Ghana Gas Company for gas supplied from Atuabo, also in the tune exceeding $100 million as at the end of 2015. Ghana Gas in turn could not pay GNPC- the current national gas aggregator- because of the debt chain, considering that the aggregator is also currently experiencing revenue shortfalls due to the prevailing low prices of crude exports. On the distribution or retail end, the Electricity Company of Ghana (ECG) is unable to settle its debts to the generation and the supply utilities because of untimely payments by mostly government and its agencies leading to legacy debts that have the potential of collapsing Ghana’s power sub-sector. ECG itself by operation is also able to collect less than 70 percent of its revenue annually and consequently making the distribution subsector the weakest link in the electricity supply and distribution cycle or value chain.